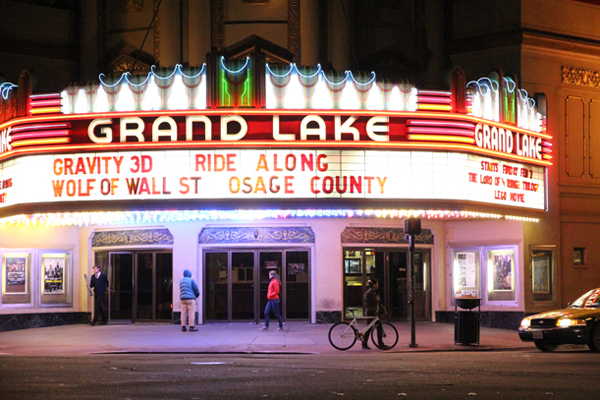 The Grand Lake Theatre, a well-known landmark of the Grand Lake neighborhood of Oakland. Oakland is a fairly dense city for the United States, registering at about 7,000 residents per square mile (2,705/sq. km) and growing. 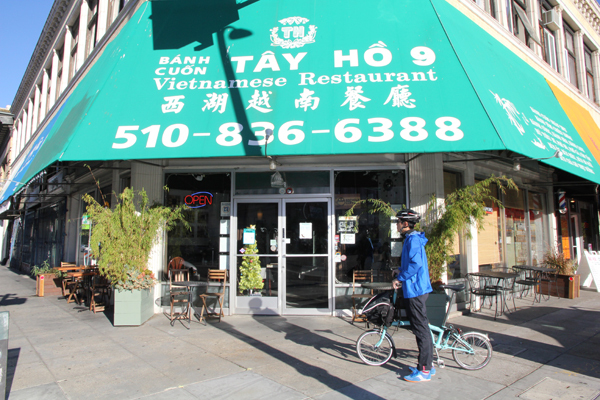 Although there are many neighborhoods which are quite suburban in character, there are significant parts of Oakland that are actually quite urban such as neighborhoods like Grand Lake, Adams Point, and Chinatown which have triple the density. Moreover, the city’s dense neighborhoods are mostly clustered together. Density is good for biking because it makes the travel distances between destinations much shorter. 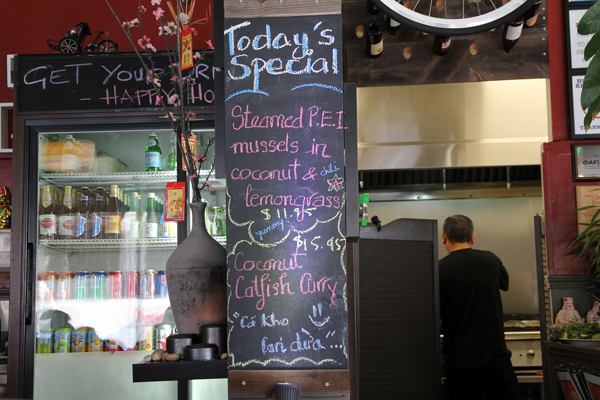 One of the things that makes Oakland a special place is that the shops here tend to be mom and pop, which means small and local. There are some chains like McDonald’s and Starbucks, but they don’t have many big box stores. So that means that most of the shops tend to have a smaller footprint. These small shops tend to have limited parking because they usually do not have their own parking lots or garages and street parking is not always plentiful. Bikes complement these small shops nicely since 10-15 bikes can fit in one car parking space. The shops are human scale and that attracts people on foot or bicycle. 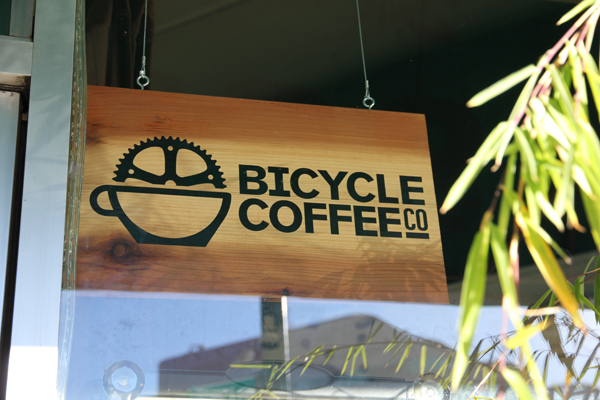 Their signs are also smaller which makes them more visible by foot and bike as well. 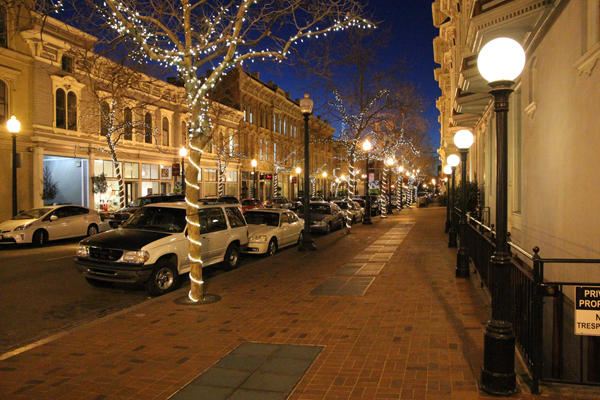 Old Oakland, a historic and charming neighborhood that is filled with small businesses. The top biking cities of Copenhagen and Amsterdam have ironing board flat topography which is very conducive for biking. But Oakland isn’t too different in this regard. Although there are the Oakland Hills, large parts of Oakland are nice and flat. A visual estimate using Google Maps shows that at least 60% of Oakland is flat and the hills are tucked to the side. A side effect of this is that you see people on bikes coming and going in every direction. Although you will rarely see a whole bunch of cyclists stopped together at a traffic light, you will see one or two turn up here and there in all directions. This is due in part to that all the bicyclists do not need to funnel into a few preferred routes to avoid hills. For example, in San Francisco, there are many areas that are empty of bicyclists and yet when you go to The Wiggle during rush hour, you will see a whole bunch of them going by like a herd of wild gazelles. That is because The Wiggle is really the only east-west route to avoid SF’s infamously steep hills. (There are still some hills on the route, but the slopes are much easier to climb.) 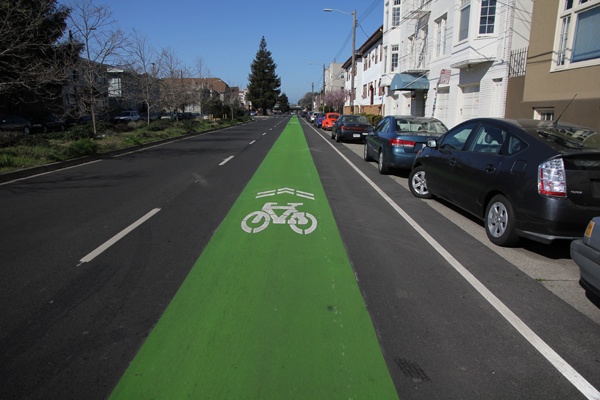 But in the flat parts of Oakland, you can bike for miles without meeting a hill. Combined with less traffic congestion, cyclists even regularly take routes without bike lanes on them. So, there is greater freedom to roam. 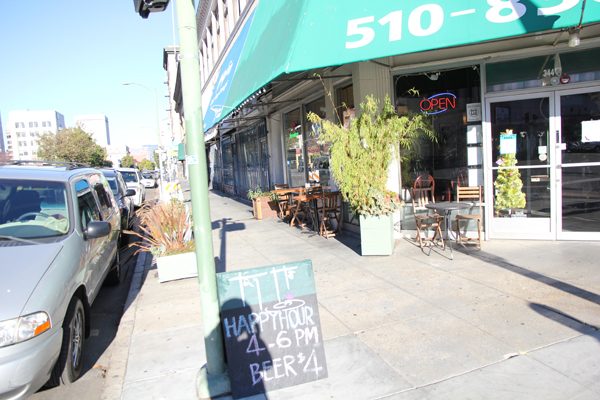 In addition to flat topography, Oakland has a lot of street space. Most streets in the urban areas are really wide and the width of many of them are not justified by the amount of car traffic that actually uses them. This underutilization is an opportunity for bike facility planners because there is enough space to put in cycle tracks without removing car lanes and/or the need to remove parking spaces. That means that, at least in theory, there will be less fighting between different interest groups over the scarce and valuable resource of space. Even if a few parking spaces have to be removed, not as many people are going to throw a fit about it because Oakland is not as space-constrained of a city yet. So in theory, it should be easier to implement bike infrastructure. But space will not always be this available. As the city grows and traffic increases, the opportunity to easily implement bike lanes with little opposition will disappear. It is better to incorporate bike infrastructure now rather than later when it will become more difficult to do just about anything in a crowded city. Super wide streets are common in Oakland which provide enough space to put in cycle tracks, or at least buffered bike lanes. 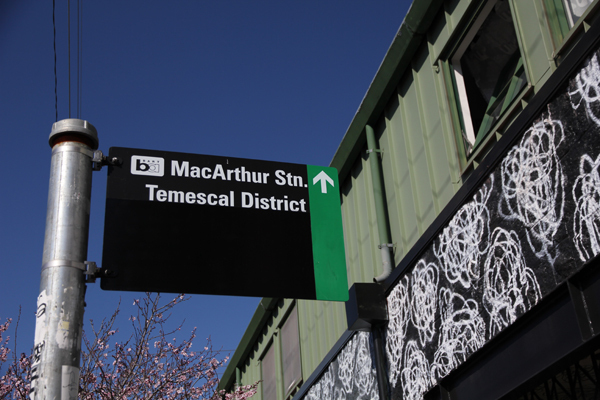 Oakland is one of the few American cities which has a decent regional public transit system. The subway-like Bay Area Rapid Transit (BART) system has 8 stations within Oakland and connects to San Francisco (which also has 8 BART stations) and a large part of the Bay Area. Thousands of Oakland residents use the BART every day to get to SF for work or play. In fact, it is quicker to get into downtown SF from certain BART stations in Oakland, than from the western neighborhoods of SF to downtown using SF’s own metro transit system. However, not all people live within walking distance of a BART station. The solution is to take a bike to the nearest station. They are actually bike-able from most places in Oakland. Plus, the BART now allows bikes on board all the time and when you get to your stop on the other end, you can use your bike to cover the last mile to your final destination. With the sleek new BART cars (designed by BMW) coming in a couple of years, they will have better on-board bike racks in which you won’t need to stand next to your bike to keep it from falling over. 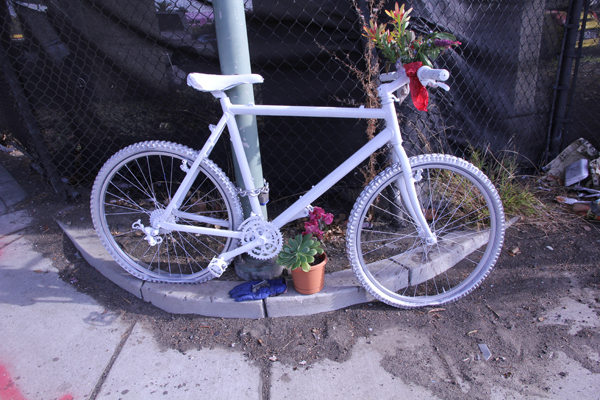 Weather-wise, in Oakland it’s almost perfect for biking. The climate is mild all year round and on average there are 261 sunny days per year. The average low is about 45 deg F (7 deg C) and average high is about 74 deg F (23 deg C). 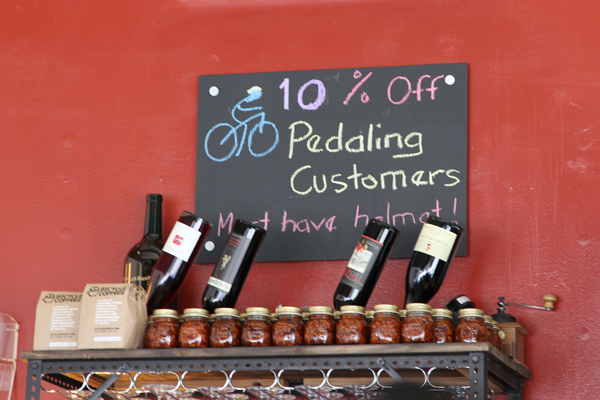 It rarely goes above 80 degrees which is great for cyclists because we don’t want to get all sweaty. It doesn’t get that windy so you won’t get that strong headwind you sometimes have to face when riding. The fog which engulfs SF for much of the year dissipates by the time it reaches Oakland and the humidity level is pretty comfortable too. 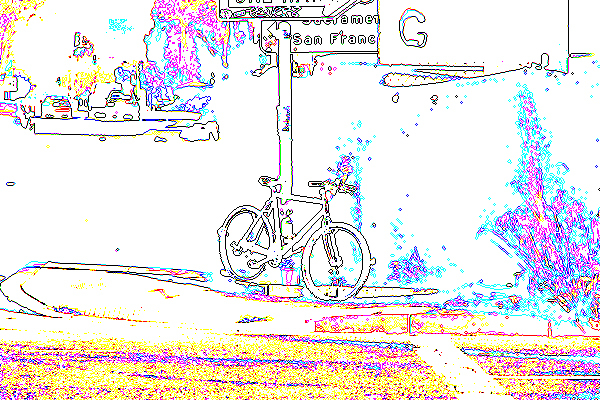 In addition to the great biking weather, riding around the better parts of Oakland can be a very visually enjoyable and stimulating experience. 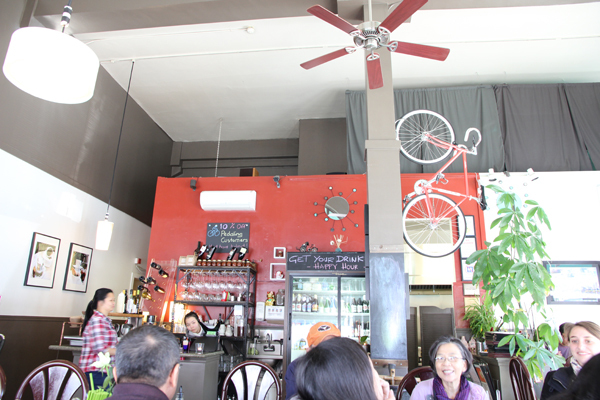 The built environment around Oakland is aesthetically charming and pretty, has lots of old growth trees, a variety of neighborhoods, a variety of architectural styles, and many unique gems. There are many churches with great architecture, some of which are old like the neo-gothic First Presbyterian Church on Broadway or new like the glassy Cathedral of Christ by Lake Merritt. There are elegant old landmark theaters in the Art Deco style such as Fox, Paramount, and Grand Lake which bring you back to the Jazz Age. Then there is the beautiful Lake Merritt known as “The Jewel of Oakland”, a natural estuary lake placed in the middle of an urban setting for everyone to enjoy. You can see Oakland’s well-known and lauded diversity of people (people of every color and background) when they gather at the lake, strolling, biking, jogging, and boating. Also, the fact that Oakland has the most artists per capita in the US, besides Greenwich Village in NYC, gives Oakland a very visible artistic flair. 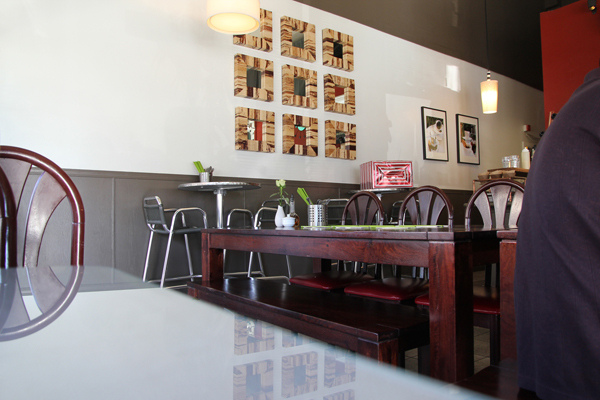 There are art galleries and murals everywhere with a great concentration of them in downtown and the waterfront. It is great to roll by on your bike and take in these interesting and sometimes unexpected sights. 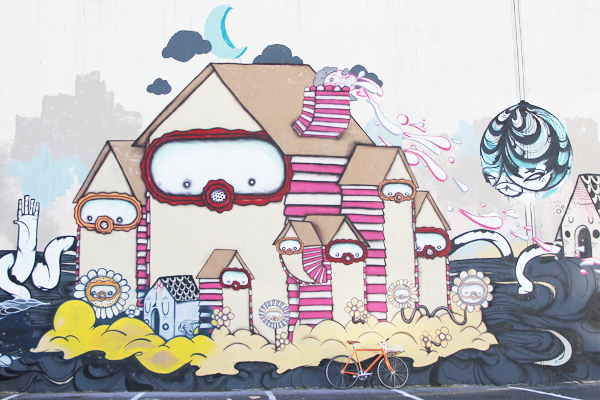 Murals are everywhere throughout the city and best discovered on a bike. Now, I’d like to point out the elephant in the room that is always there when speaking of Oakland. Yes, as many of you have heard, Oakland does have a lot of poor residents and yes, it does have a problem with crime. 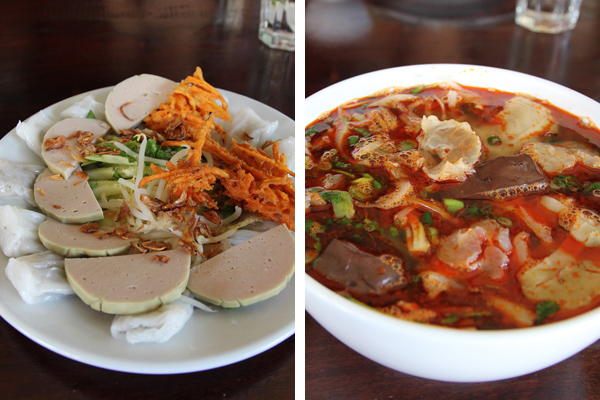 Much like SF, Oakland is also a city of contrasts. So even though there are wealthy neighborhoods like Rockridge, Piedmont (which is technically its own city contained within the city of Oakland) and the Oakland Hills, there are lots of poor neighborhoods with a depressing and disturbing amount of blight. Even though Oakland has a lot of assets, culturally and physically, that other cities dream about, it also has an alarming amount of crime. 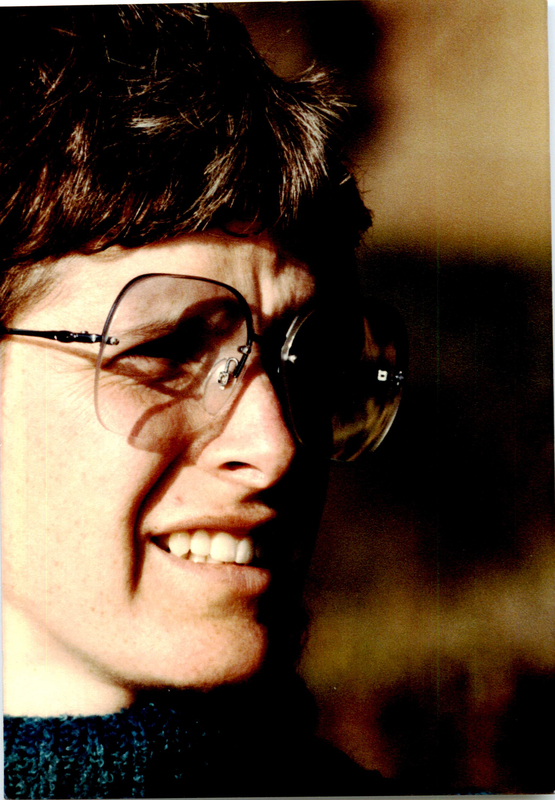 We all know that Oakland has long been comprised of low-income residents. The estimated household income for Oakland in 2011 was just a little bit over $50K and currently, the unemployment rate is at 11%. During the recession, Oakland was hit hard and the already financially strained city had to suffer through massive foreclosures. This took a toll on the city’s funds and they had to dramatically cut services. While the city has been forced to find ways to cut costs, these problems only make it more important for the city to look into investing in bicycle infrastructure. Bike infrastructure costs only a fraction of what costs for both car-oriented and mass transit infrastructure. 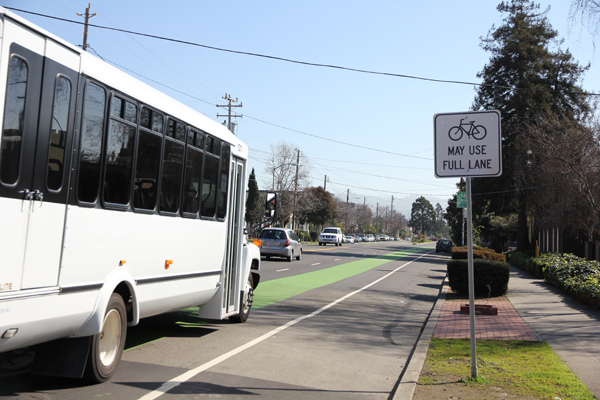 As well as saving money for the city, it also saves money for its residents at an individual level since more people will have the option to commute by bicycle since they will feel more safe and comfortable to do so when bike lanes are put in. More people will not have to own a car or can use their cars less frequently, saving them money. A study in Copenhagen showed that riding a bike for a mile provided an economic net gain of $0.42 while driving produced a net loss of $0.20. If there was any city that needed bike infrastructure the most it would be one that is economically strained, such as Oakland. The other problem Oakland has is its crime rate. Although its robbery rate has dropped 26% and the homicide rate has gone down by 30% at the end of 2013, its crime figures still remain embaressingly high. 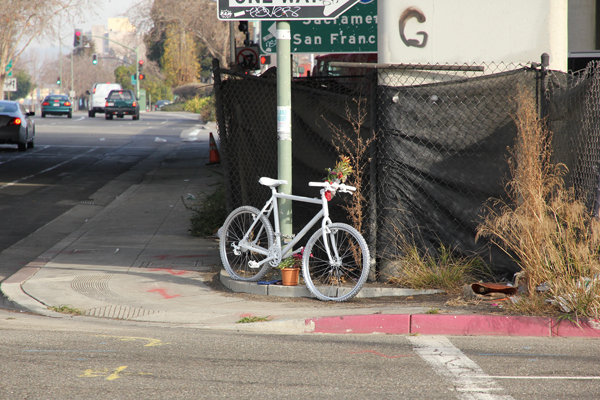 Having real bike infrastructure would make Oakland a better city for its residents and a worse place for criminals. If more people are encouraged to bike, there would be more eyes on the streets. Having more eyes deters crime and is something even the famous urbanist Jane Jacobs has written about. More riding of bikes also means less parked cars which provide barriers needed for discreet drug dealing or other hidden criminal activities. A real example of this can be seen in SF, where they recently banned parking on the worst block in the seedy Tenderloin neighborhood. Crime dropped immediately. It is the poverty and crime which has held Oakland back from taking its rightful seat as a world-class city (they’ve got the 5th busiest port in the country and their own international airport for crying out loud). That and the fact that San Francisco, its neighbor across the bay, has stolen a lot of the attention away. 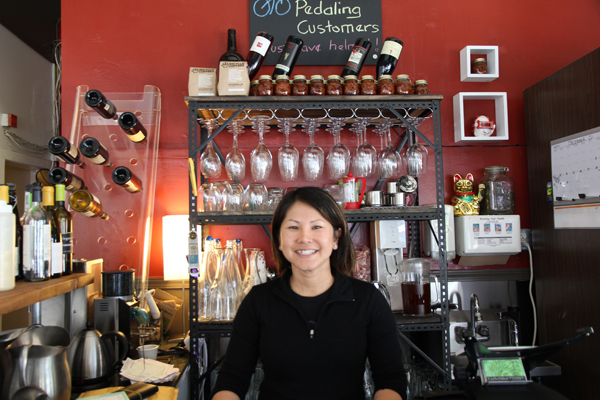 But because of San Francisco’s recent stunning economic growth, Oakland is also changing. Even Chip Johnson from the SF Chronicle admits there is something special happening right now in Oakland. 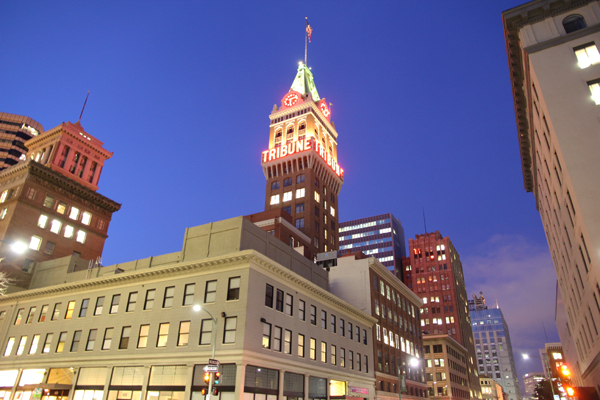 A view of the Tribune Tower in downtown Oakland during dusk. 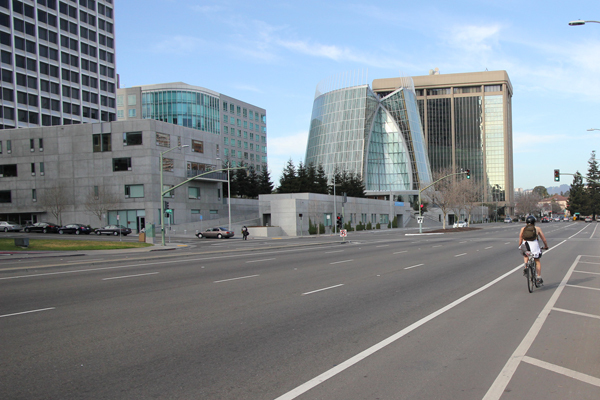 Right now, Oakland has about 100 miles of bike lanes, but none are protected or buffered from cars. 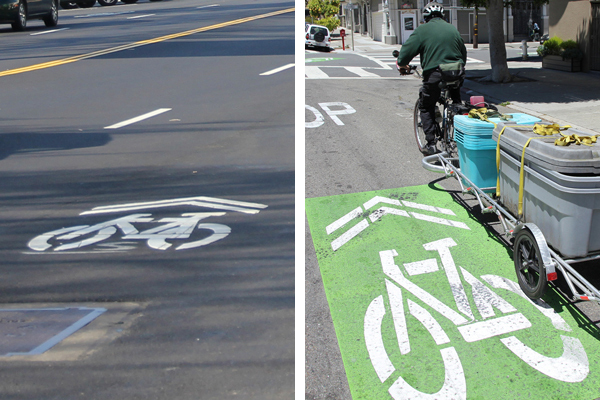 A lot of them are comprised of these silly painted bike sharrows that I think should be completely eliminated. And some bike lanes just disappear right under your pedals. But even with its lack of real bicycle infrastructure, this city still observes a commute modal share for bicycles of 3% in 2012, an increase of 40% since 2010. What’s also interesting about these stats is that the gender split between male and female riders is about 50:50. That’s rare unless you’re in one of those bike-friendly European cities. Oakland is a city with a lot going for it and if it can fix its problem with poverty and get its crime under control it will become another amazing city that people everywhere will want to visit. 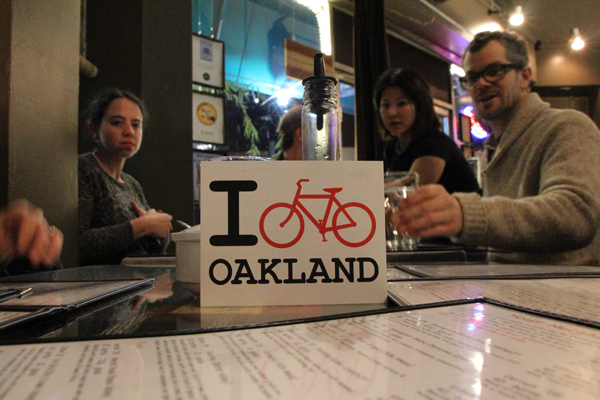 Oakland also has a lot going for it bike-wise and if it can truly embrace biking by financially supporting bike improvements in a significant way, it could become one the best bike cities in the US. It would not just be great because it would have cycle tracks and such but also because it is an incredibly rewarding and pleasant urban city to ride your bike in. 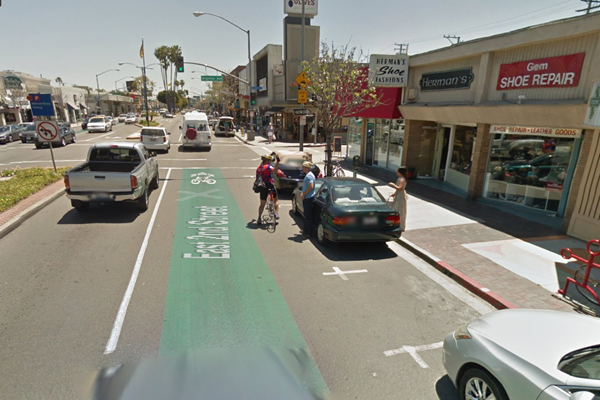 The biking in turn would make Oakland an even more desirable city. It would be wonderful. 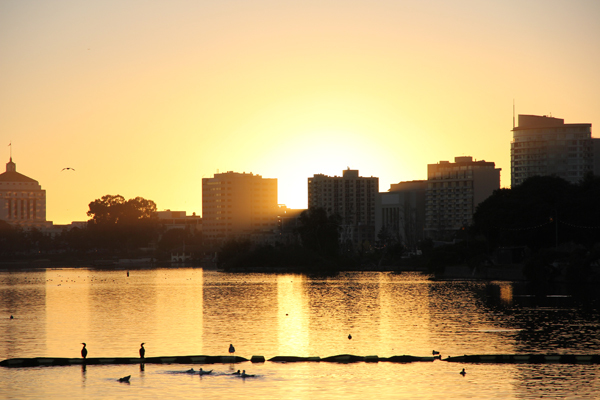 The “Jewel of Oakland”, Lake Merritt is a beautiful urban lake centrally located in the middle of the city.